The firearms training industry has some incredible instructors—quality people that conduct quality courses. There is much to be learned from them. Unfortunately it also draws people with a variety of significant personality problems—especially those that make false claims of being former Special Forces, lie about their experience, and/or teach tacticool courses that are often unsafe and are entertainment, not training. If you are looking to become an instructor or to take intermediate to advanced firearm training classes, the first thing you should understand is there is no organization that monitors claims by firearm instructors to determine if they are true—even the organizations that offer certifications. Sadly, the industry has numerous people that regularly lie about their experience. Equally as bad, the industry is filled with people teaching things that are just plain wrong, that they have no training/certification to teach, and/or that are entirely inappropriate for civilians. The most common lie by firearms instructors about their background is Stolen Valor, claiming that they were in combat when in fact they never were. Instead, their military service, if any, was spent in a non-combat role. Other lies include giving false information about the quantity of classes/students taught and claiming to teach classes for law enforcement officers, federal agents, military personnel, and security officers. So why do these charlatans make their false claims? Generally the same reason politicians do; you would be unlikely to hire (elect) them if you really knew the truth about them. They conjure their lies to deceive you into thinking they are something they are not. They count on the fact that VERY few people actually bother to research anything, despite how easy it is to do today. They also count on many of their lies being difficult to research. If you were searching for information on an instructor whose class you were considering attending and saw the Google result above, would you still want to give them your money? Perhaps you mark it off as some kind of misunderstanding and keep looking. How about you then discover an arrest for larceny? Perhaps you mark that off too since it’s only an arrest, not a conviction. You see the instructor claim to teach law enforcement classes, but those classes are NEVER listed on their upcoming events. Further, nothing in the tiny bit the instructor tells you about themselves indicates any reason why law enforcement officers would need to, or even want to, take any training from them. Maybe they claim to have been teaching firearms for the last decade. Here’s a trick for seeing how long their Facebook page has existed, check the creation date by clicking on “Info and Ads” on the left column. You keep searching for information about the instructor, but you’ve reached the end of what can be found without spending a significant amount of time. Congratulations, you’ve unearthed another Ghost Instructor! A Ghost Instructor is one that seems to have no past beyond what THEY tell you about themselves. They are the charlatans of the firearms instruction world. They’ll brag about what awesome instructors they are and maybe the classes they have taken. They are probably a pathological liar, telling so many lies that they aren’t certain of what the truth actually is. Their minimal online presence will be substantially about themselves and littered with pictures of them holding firearms. They are a legend in their own minds! If you’re looking for an instructor, move on from the Ghost Instructor—find one of the multitude of instructors that actually has a past that they don’t need to hide from you and is honest about themselves, their experience, and their capabilities! We regularly hear stories from people that unknowingly attend classes put on by Ghost Instructors. The reports include instructors spending a significant amount of class time talking about themselves (primarily embellishments or outright lies…), screaming at students for making minor mistakes, and unsafe drills on the range. Do your research—Caveat Emptor! Once the shooting fundamentals have been mastered, training needs to involve thinking and decision making. We are always looking for drills that can be shot on a static range, even one that doesn’t allow holster draw, that cause the shooter to have to think. The Dealer’s Choice Drill requires precision shooting, decision making, target identification, speed, and is fun! 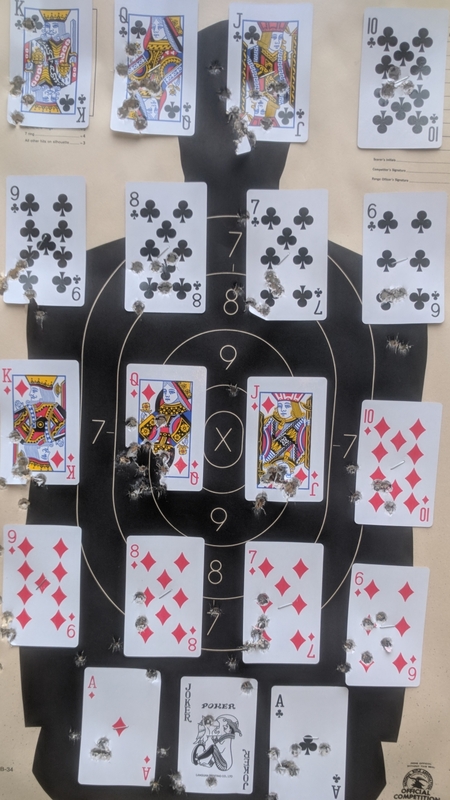 The Dealer’s Choice Drill takes Tom Givens’ Casino Drill to the next level by providing an almost limitless combination of shooting tasks of varying complexity that require very precise shooting. This makes it ideal for Instructors to use in working on decision making skills with a large group of students. The Instructor calls out what is to be shot. The first thing you need is a deck of cards divided by suit. One deck will give you enough for two targets with a red and a black suite on each target. (You can get 12 decks for around $10 on Amazon, making the cost per target less than 50¢.) The cards are stapled onto the backer in some ordered pattern, rather than randomly. You’ll discover the Dealer’s Choice Drill is hard enough without having 26+ randomly ordered cards to have to search through. If you are able to master the drill using patterned cards, you can increase the complexity by several orders of magnitude by random positioning. While there are various card deck printed targets you can buy, I haven’t found a target with an ordered deck of cards. The closest is the Birchwood casey 37026 Eze-Scorer which is 23″x35″ and is $1.00 per target, but the cards are randomly placed and the face cards aren’t pictures. Beware of other targets where the playing cards are substantially reduced in size, making card identification much harder and requiring you to shoot much closer. Using an app like Randomizer+ Random Pick Generator – Decision Maker, you can enter a list of all of the combinations you want to shoot and have the app randomly tell you what to shoot each time you press the button. Three yards seems to be an ideal distance to shoot the Dealer’s Choice Drill from. It is close enough that shooters should be able to clearly identify the individual cards, yet far enough to make putting accurate hits on each 2.25″ x 3.5″ playing card a challenge. The drill can be shot from the holster or the low ready position. The time to complete a given firing command is going to be heavily dependent on the number of cards to be shot and the complexity of that command. The best measure is going to be adding the times for a collection of firing commands. By randomizing the order, the collective time for one session can be compared against previous sessions while eliminating speed increases due to memorizing the drill. We’d love to hear about your experiences with the Dealer’s Choice Drill and any variations you come up with. We have a Facebook page dedicated to the drill for your feedback. Once a month, Jody and I hold a Defensive Combat (DC) class. The real world scenario based class involves lots of moving, decision making, and of course shooting. By moving, I don’t mean the typical take one step to the left (right, forward, or backward) that you find in classes with 30 students on the line—I mean continuously moving while engaging multiple reactive targets. In the blazing Florida heat, safety dictates that watching for any signs of fatigue in the students is paramount. Once we observe it, it’s time to conclude the training as both safety and learning will decline. With the news of a negligent discharge (ND) this past weekend by one of the icons of the firearm training industry, I evaluated what information was available to seek the root cause. The ND happened at the end of the training class, just before the qualification shoot. At least three people had confirmed that the revolver was unloaded prior to the ND. So how can three people, one an industry icon and another a Range Safety Officer, miss seeing a round in a revolver’s cylinder? Some will cite confirmation bias—we see what we want to see. If we expect to see a cylinder devoid of cartridges because we know the gun is unloaded, that’s what we tend to see. We know the gun is empty, so we go through the rote of opening the cylinder and then closing it. But at least three people failed to see the cartridge; confirmation bias alone does not explain this safety mirage. I don’t know what the weather conditions were that weekend where the class was held and I don’t know how long everyone had been on the range that day or the day(s) leading up to it. Based on typical descriptions for the type of class where the ND occurred and this being just before the final qualification, everyone had likely been on the range a great deal. Let’s face it, we tend to get sloppy when we are fatigued; with firearms, sloppy equals dangerous. This doesn’t usually get taught in Instructor or RSO classes, but it should! While it is critical for Instructors and RSOs to be watching for signs of fatigue in others, it is just as important for every person on the range to be watching for signs of fatigue in others AND THEMSELVES. Signs to look for in others and ourselves include loss of motivation, slowed reflexes and responses, poor concentration, sore or aching muscles, and weakness. We don’t learn well when we are fatigued, nor do we perform well. One of the unmistakable signs of fatigue is wanting to get the shooting over with. When you find yourself taking shots that you know aren’t going to be good, you have reached the end of valuable training. None of us want to face it, but we are all getting older and fatigue sets in earlier and often more suddenly than when we were in our prime. There is no magic cure for fatigue; when we’ve pushed our body to its limits, we start entering a state where it is much easier—and likely—to make mistakes. We can, however, take some steps to delay the onset of fatigue. Starting off the day well rested will have considerable impact on delaying fatigue. Staying hydrated means consciously forcing yourself to drink; if you wait until you are thirsty it’s already too late. Particularly in the heat, stick with water and products designed to replace vitamins and minerals lost through exertion and sweating. Speaking of sweating, pay close attention to the amount of sweat produced by yourself and others. The cessation of sweating is a telltale sign of heatstroke—a medical emergency. Instructors should be giving their students regular breaks where there can go inside to an air conditioned environment or at least get into the cooler shade to sit down and relax. Instructors should also be constantly reminding the students to drink. Eating small snacks is another good idea. Our range has shade sails suspended over it so that shooters can avoid the sun as much as possible. It has large gazebos with picnic tables for the non-shooters to remain in the shade and be able to sit down. We are also in the process of adding fans in the gazebos and on the range to help as well. People with medical issues can become fatigued much more rapidly than others. This is why paying attention to everyone on the range, shooters or Instructors/RSOs, is vitally important to the safety of all. As certain drugs can have side effects brought about by sunlight, everyone should be aware of the potential effects of what they are taking. For Instructors, finding out if anyone has a medical condition that could impact their range experience is important. It can be as simple as asking at the beginning of a class for anyone with any potential issues to speak with you during a break. Including a short section in the range briefing about fatigue is another good idea. Get a good night’s rest before the class or range session. Take water and sports drinks, along with snacks, with you. Recognize those signs of fatigue in yourself and others so that you can have a safe and valuable range experience. Most importantly, know when it is time to stop training. The NRA has been deluged for a very long time with requests from the public for an actual NRA CCW class (as opposed to the Basics of Pistol Shooting class that is aimed at any and all legal uses of handguns). In response, the NRA announced a new modular CCW Course yesterday that will allow Instructors certified in this new discipline (Basic NRA CCW) to teach an NRA CCW class. Thus far the existence of the course, officially named the “Basic NRA CCW” course, has not been made public. In an email to Training Counselors sent out yesterday, we were told a little about the new course and given an opportunity to sign up for one of the first two course sessions being held during the NRA Annual Meeting in Dallas at the beginning of next month. I’ll be attending the very first session and will report on what I learn there about the course. The course is modular so that the Instructor can teach only the portions needed to meet the requirements of their state permitting process. This means that the course can vary in length from 1 to 16 hours. It also means that a state specific, non-NRA legal module and/or live fire qualification can be included. The course the TCs are taking is 8 hours, but I have no idea how that will translate into what Instructor Candidates will have to take. I strongly suspect that the student version the Instructor Candidates have to first take will be 8+ hours and the Instructor class will also be 8+ hours. My suspicion is that the NRA CCW course will take sections from the Basics of Pistol Shooting and Defensive Pistol in order to create the modules. If that’s what was done, it should be an excellent course! This is a way to differentiate your classes from the typical 1-3 hour CCW classes seen everywhere. This will be an actual NRA class with an NRA certificate. Until I’ve seen the actual modules, it’s hard to say how long a minimum course for Florida will be, but it’s entirely conceivable that it could be around 4+/- hours. You’ll be teaching NRA approved curriculum instead of something you created yourself. Unless you have the credentials to be developing curriculum yourself (NRA civilian ratings DO NOT provide those credentials), this makes the new NRA CCW class particularly attractive. Since NRA CCW classes ARE NRA classes, you’ll be able to register them on the Instructor Portal. This means that your classes will show up in searches anyone does on the website. Despite the trashing from the main stream media, the NRA remains the most respected source of firearm training and people will seek out these classes when they are publicly announced. The modular format of the class means that you can easily break it down into multiple sessions/days. You could even break it into the initial class covering all of the necessary modules and then additional classes covering other modules. Some very successful trainers are already employing this tactic to increase attendance. We will update you when we know more and when we have classes scheduled. This is a hybrid class that combines the NRA’s FIRST Steps Shotgun class with our own material that covers the use of a shotgun for defense. The NRA FIRST Steps Shotgun course is designed to provide a hands-on introduction to the safe handling and proper orientation to one specific shotgun model. 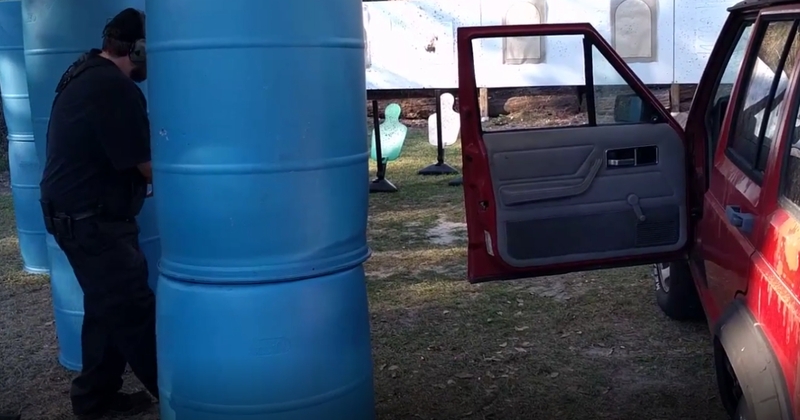 This course is at least three hours long and includes classroom and range time learning to shoot a specific model shotgun at a moving target. Students will learn the NRA’s rules for safe gun handling; the particular shotgun model parts and operation; ammunition; shooting fundamentals; cleaning the shotgun; and continued opportunities for skill development. Students will receive the Basics of Shotgun Shooting handbook, NRA Gun Safety Rules brochure, Winchester/NRA Marksmanship Qualification booklet and FIRST Steps Course completion certificate. In our custom portion of the class, we cover selection of a shotgun for home defense, considerations for defensive ammunition, accessorizing a defensive shotgun, and range time dedicated to defensive situations. We provide everything including our shotguns, ammo, hearing and eye protection, and targets. This is a hybrid class that combines the NRA’s FIRST Steps Rifle class with our own material that covers the use of a rifle for defense. NRA FIRST Steps Rifle is designed to provide a hands-on introduction to the safe handling and proper orientation to one specific rifle action type. This course is at least three hours long and includes classroom and range time learning to shoot a specific rifle action type. Students will learn the NRA’s rules for safe gun handling; the particular rifle model parts and operation; ammunition; shooting fundamentals; cleaning the rifle; and continued opportunities for skill development. Students will receive the Basics of Rifle Shooting handbook, NRA Gun Safety Rules brochure, Winchester/NRA Marksmanship Qualification booklet and FIRST Steps Course completion certificate. In our custom portion of the class, we cover selection of an AR-15 for home defense, considerations for defensive ammunition, accessorizing a defensive rifle, and range time dedicated to defensive situations. We’ll also give an overview of building your own AR-15 from parts you choose. We provide everything including our AR-15 rifles and pistols, ammo, hearing and eye protection, and targets.